Today we will discuss and analysis of Carnot cycle. 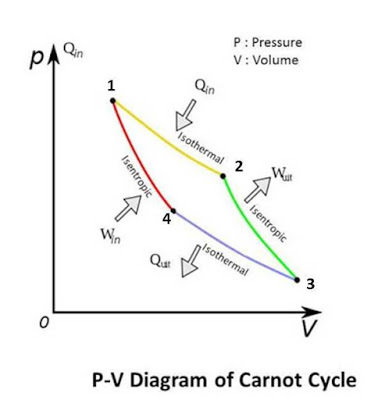 Carnot cycle is one of the air standard cycle. It is given by a French engineer, Sadi Carnot so named as Carnot cycle. This is an ideal cycle of all thermodynamic cycle because it gives maximum efficiency between two temperature difference. When we study about any other cycle, we compare it to the Carnot cycle, which will give the maximum work output between these temperature range. As we have discuss in our last post that in air standard cycle we assume air as the working fuel but actually air with fuel use as working fluid. In Carnot cycle analysis we assume that air is used as the working fluid and it complete a cyclic process. So in Carnot cycle air standard analysis we assume a reciprocating engine in which air is filled which act as the working fluid. A heat reservoir is used at head for Heat addition and heat rejection. Carnot cycle is combination of four thermodynamic process, in which two are isothermal processes and the remaining one are isentropic processes. Isothermal process is also known as constant temperature process in which temperature of working fluid remain constant until process done. In isentropic process the entropy of system remain constant which mean the system would not emit or absorb heat until whole process. The combination of this process makes the Carnot cycle. isentropically. 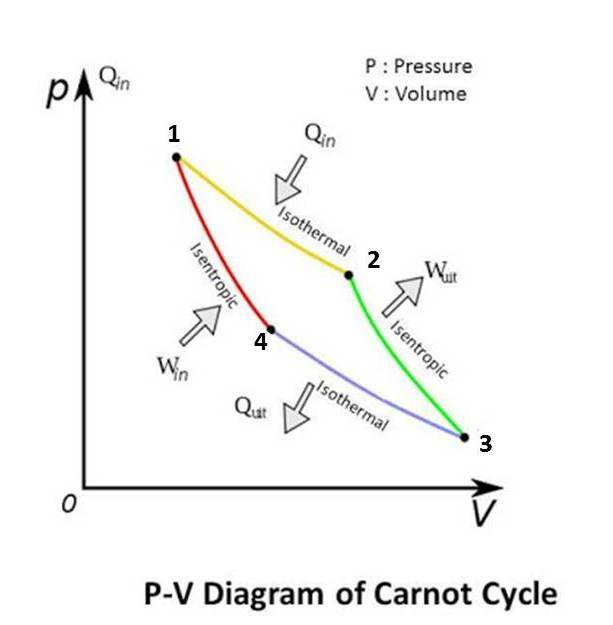 In Carnot cycle we assume a piston cylinder device which is insulated from surrounding. No heat can add or removed from the system. The head of the system can be replaceable during process by the heat reservoir. At the starting the piston is at the top or at top dead center of cyclinder. At this position the insulated head replaced by the higher temperature heat reservoir which add the heat energy into the system by Zeroth law. This heat energy move or expand the piston downward. One thing note that the heat energy added by reservoir does not rise the temperature of the system. It only done work by expanding piston So this process is done isothermically. When the piston reaches mid of the cylinder, the head is replaced by the insulated head so no heat can add into the system but due to inertia of the piston, it expand continuously by using the heat of the working fluid (Air) which down the temperature of the system. Because no extra heat is added into the system, this process done issentropically. At this point piston reaches its maximum downward limits or at bottom dead center. Now the cylinder head replaced by the lower temperature heat reservoir which absorb the heat from the system. Due to this the air contracts to maintain its temperature constant. The piston moves upward or compresses the air. In this process the heat removed by the system used to compress the system and the temperature of system remains constant. So the compression done isothermically. When the piston is at mid of the cylinder the heat reservoir at head replaced by the insulated head. So no head is removed from system at this end. Due to inertia of piston it moves continuously upward which compressed the air and increase its temperature. No heat is added or removed until this compression so this process done issentropically. At this point the piston reaches its initial condition (Top dead center), so complete a cyclic process. The working fluid (Air) also reached its initial condition so it completes a thermodynamic cycle. In this process the heat is added into the system and the piston expand isothermally. In this process the temperature of the air remains constant. Where is r is compression ratio. Where γ is specific heat ratio of air. In this process the air is compressed and heat is removed from the system. In this process the temperature of the air remains constant. In this process the no heat is added into the system and the piston compress the air isentropically. In this process the temperature of air increases from the initial temperature. In this process the work done on the system. From the above equation , we see that the efficiency of Carnot cycle increases by increasing higher temperature of cycle (T1) or by decreasing the lower temperature of cycle (T3).It is impossible to make a engine work on Carnot cycle because to achieve isothermal expansion and compression the piston should run extremely slow to ensure that the air is always at same temperature and isentropic expansion and compression should carried out as fast as possible to no exchange of heat. Between two fixed temperatures Carnot cycle has the maximum possible efficiency compared to other slandered cycles. The Carnot cycle does not have any real life example so it is ideal cycle not a practical cycle.Today we have discussed about working of Carnot cycle and analysis of Carnot cycle. If you have any query ask by commenting. If you like this article, don’t forget to share it on social networks. Subscribe our website for more informative articles. Thanks for reading it. ← What are Air Standard Cycles and its Assumptions?